Orphaned Land frontman Kobi Farhi has opened his heart about the bloody conflict that’s tearing apart his home country and causing division amongst his band’s fans. But just weeks later Farhi, his friends and family found themselves running for their lives to bomb shelters as war broke out between Israel and neighbouring Gaza. It’s believed nearly 2000 people have been killed in the most recent rounds of rocket attacks and ground action. Tel Aviv-based Farhi, who’s continued to call for peace and understanding in the Middle East, has faced fury for refusing to choose Israeli interests over Palestinian, or vice-verse. 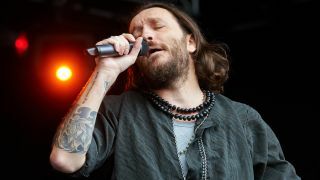 Yesterday, following Orphaned Land’s performance at Bloodstock, he spoke to TeamRock about how the recent violence has left him “bitter and sad” – but how he continues to hope he can play a part in bringing lasting peace to the Middle-east. “These are the worst times for people like the members of Orphaned Land. The conflict began when three Israelis were kidnapped. They were already kidnapped when we participated in the Metal Hammer Awards. When we got home we discovered they’d been murdered. That led into a blood circle that started with the Israeli army attacking Gaza. Gaza were sending rockets before that towards Israel. “When the Israel Defence Forces started to attack, Gaza started to launch rockets towards Tel Aviv and Jerusalem. The irony is that, even in those cities, Arabs are living. I found myself running for shelter three or four times a day, sometimes in the night. I was sleeping with my clothes. I was taking a shower with clothes three seconds away in case there was a siren. “In the south of the country you have 15 seconds to take shelter. In Tel Aviv you have between a minute and a minute and a half to run to the shelter, and hope that rocket will not fall on your head. That’s a crazy life for us, and for the people of Gaza. “I haven’t slept well –– every second of third sound reminds me of the siren. It could be a solo guitar; it could be a motorcycle. I find myself jumping six times a day for things that sound like the siren. It happened to me in London; I’m still traumatised. “But I understand more my mission, coming from that region. We have a very important mission to bring hope to people, to bring them together. “If you take me as an Israeli and Abed as a Palestinian… When I shared the award with him and we said on the only conflict is who will pay for the beer, that was not a cliche – it was the absolute truth. If we could only copy and paste me and Abed a trillion times, and throw that inspiration instead of rockets over the Middle East, we could have some real change. “We feel like we’re some of very few awakened from a deep slumber. It’s not just Israel and Gaza. Look what happens in Syria, look what happens in Iraq with Isis. The place is full of weapons, fire and death. Terrible things are happening – and we can’t stop them with our guitars and lyrics. “Since the conflict started no one remembers the good; everyone wants you on their side. Israeli fans want to hear me standing for Israel. Arab fans want to hear me standing against the Israeli government and they want to hear I’m pro-Palestiniain. It’s a hard conflict. I’m privileged to have both Israeli and Palestinian fans. I cannot take any side – not because I’m trying to be politically correct, but because I think everybody’s wrong in war. I’m trying to co-exist with my Palestinian friends and I know everybody’s wrong. Yet everything I say is interpreted in so many ways. “To be honest, I’m bitter and sad. I don’t see how I can change it in my lifetime unless something magnificent happens. “But I have the privilege to be a musician so I keep on spreading hope. I meet desperation every day. I find more and more people writing us that we give them hope, that we’re like a sparkle of light and music is a cure. They motivate me. We can only inspire people. Even the few we inspire motivates us to continue. “I always find comfort with music. Without music we’d all be doomed and cursed. If there’s any spark of light in the darkened days, we have in Israel where innocent people are dying, it is music. During July I had inspiration and ideas for five songs – even in that rock-bottom you can find inspiration. Listen to the full interview tomorrow night (Tuesday 12th August, 9pm BST) on the Metal Hammer Radio Show.